You will find any excuse for a cuppa with the “Tea Time Treats” Tea & Coffee Gift Basket. Filled full of your favourite cakes, muffins and biscuits of your choice to go with a perfect cup of tea from the New English Tea Selection or why not try our absolute favourite coffee from The Teesside Coffee Co and their delicious Colombian coffee. A winning combination by any means and a gift to delight any recipient. New English Tea Selection – 10 x Earl Grey Tea Bags. 10 x English Breakfast Tea Bags. 10 x English Afternoon Tea Bags. The alcohol content within our gift hampers are not suitable for anyone under 18. 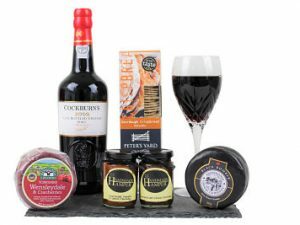 Make this gift personal, by adding their favourite cheese and chutney to accompany the carefully selected ports. A box full of award winning favourites. The Disaronno Gift Hamper, with its bittersweet amber liqueur. 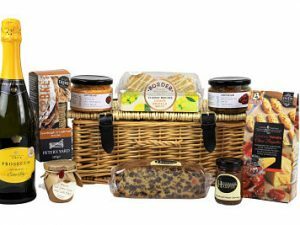 Accompanied by a selection of gourmet nibbles of your choice to create the perfect bespoke hamper.